Nov. 2009 KRS Reading Group! Dec. 2009 KRS Reading Group! Happy New Year! We are so humbled and gratified to report that Kids Reading for Success has not only made it to its one year anniversary but has succeeded in reaching its goals ... beyond our expectations. 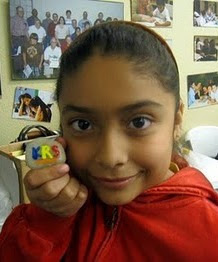 When we started KRS just one year ago, we had so many ideas about how we would create and grow the program. There were a lot of ideas, a lot of brainstorming and research, and above all, an overwhelming sense of hope and optimism about our goal of helping kids reach their potential through literacy. We had no idea where it was going to take us, whether KRS would progress beyond a couple of kids and volunteers… and most importantly, whether it would make a real difference in the lives of some kids in need. Over the past year, KRS entered into a wonderful partnership with Lake Avenue Foundation’s Students and Tutors Achieving Real Success (STARS) after-school program. One Saturday a month starting in December 2008, a group of our dedicated KRS volunteers have come rain or shine to work with STARS’ kids to nurture a love of reading and the arts. As you can see by our past blog entries, the kids have been motivated to improve their reading skills with the help of our volunteers, and the latter have had a blast in the process. KRS’ volunteers are a group of dynamic people with busy schedules, and yet they find the time to volunteer and give back, and for that, we are so grateful. In 2009, a KRS Advisory Board was formed to help make crucial decisions regarding our direction and to guide our program to greater heights. We have high hopes that, under the leadership of our Advisory Board, 2010 will bring some great developments for KRS. Among other things, we're planning a speaker series, local field trips, and an annual fundraising event. Our goal is to continue working with STARS but to also grow KRS and partner with another local area organization (like STARS) to promote literacy. - Brynna K. for our beautiful logos... aren't they wonderful? - our regular volunteers who bring not only their time but donations of food and books: Roselle B., Donna B., Brett K., Allan W., Dave Y., Claudia N., Katie M., Randi K., Kieu L., Rosiris P., Nancy F. and Jay V., Jim G., Amanda L., Angelique W., Vanessa L., Norbert C., Leanne K., Phu D.
There are too many others to name. As we look forward to the new year, we want to thank all of you from the bottom of our hearts. You have made a real difference in the lives of some wonderful children. May 2010 bring you peace, happiness, and warmth of heart. Happy New Year! P.S. Come join us on Jan. 9, 2010 for our first 2010 Saturday reading program! We will post the KRS program schedule in January!